Perma Clear Seal is a colourless coating which is quick-drying. It penetrates into the pores of the material under treatment to bind the particles together in tough resilient, abrasive-resistant enamel.It provides a protective barrier on porous surfaces, which resists chemical attack and eliminates dusting. Integral Protection : Perma Clear Seal Penetrates the capillary structure and provides a tough and clear protection. Perma Clear Seal Failure will not occur through peeling of the surface coating. Vapour Permeable : Perma Clear Seal allows concrete surfaces to breath. Although forming an enamel coating impervious to water. Perma Clear Seal allows the escape of water-vapour which could otherwise cause blistering. Water : Perma Clear Seal is water-free this means that application can take place down to oC provided surface is frost/Ice free. Economical : Perma Clear Seal is economical. it gives long Life protection at 10% of the cost of an epoxy finish. Ease of application : Can be applied by even an unskilled labour since it is just a brush application. Lower Maintenance Cost : By Hardening and protecting building surfaces with a tough enamel coating, porous structures can be given a longer life and normal maintenance costs can be greatly reduced. t his applied equally to external walls and pavings. 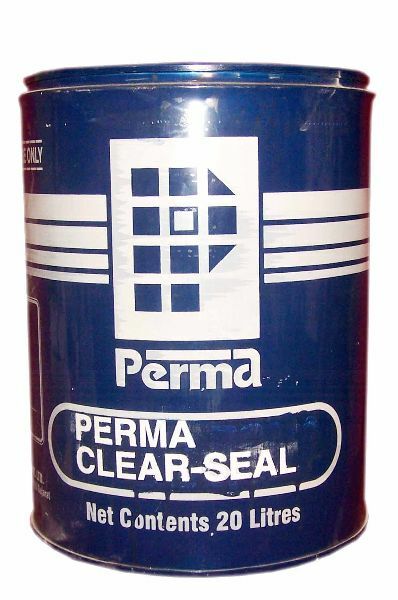 Packing : Perma Clear Seal is available in 1 Ltr., 10 Ltr. & 20 Ltr. metal containers. Perma Clear Seal can be stored between 10 oC and 45 oC. Preferably store at below 25 oC. Keep away from sources of ignition. Keep away from food stuffs.